This is a week marked by the gift of the Eucharist as well as the last days, the intense suffering and death on a cross where Jesus poured out his love for us. "No one has greater love than this, to lay down one's life for one's friends." (Jn 15:13) We are all friends of Jesus and his words on the eve of his death give true meaning to the cross. Today I am struck by the prayer after Communion ( one that I seldom read nor seem to take hear): "Visit your people, O Lord, we pray, and with ever watchful love look upon the hearts dedicated to you by means of these sacred mysteries, so that under your protection we may keep safe this remedy of eternal salvation, which by your mercy we have received. We ask this through Christ our Lord." 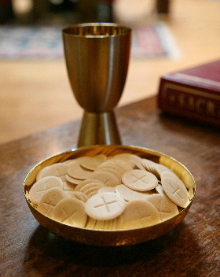 Having just received Jesus in the Eucharist, does the "visit your people" mean that I am asking Jesus to be with all of us and then we may profit by "this remedy of eternal salvation"? I need to ponder the prayer to really understand what I am asking.